We are one of the organized quartets in the Bozeman Chord Rustlers—The Quaternions. What the heck is are Quaternions? According to Wikipedia (the repository of all knowledge, right? ), quaternions “are a number system that extends the complex numbers. … [They] form a four dimensional associative normed division algebra over the real numbers.” Importantly, i2 + j2 + k2 = –1. Yikes!! At least it involves four things. 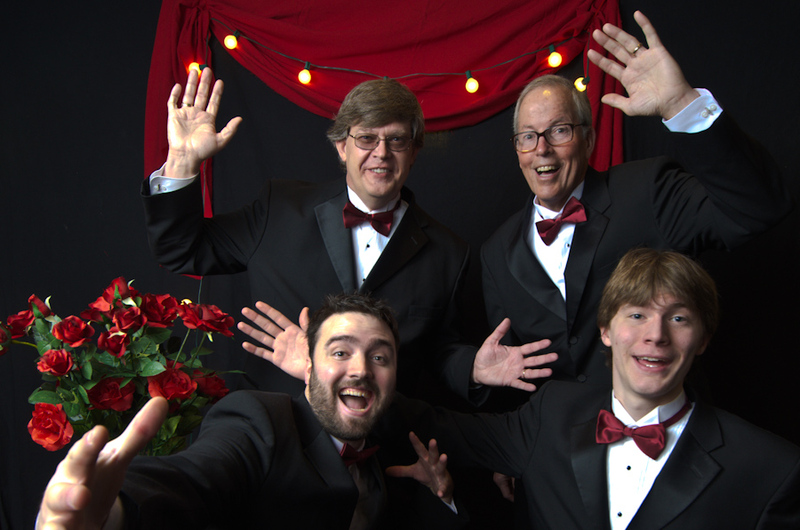 So the Quaternions Quartet is a group of three complex guys (all computer scientists) and a real one (a history guy) who have come together to sing barbershop harmony. John Sheppard (i2), the lead, is a computer science professor at MSU. Jesse Sheppard ( j2), our bass, graduated with a math degree from MSU and is now a PhD student in the computer science department. Shane Strasser (k2), our tenor, was a double major in math and computer science and is about to complete his PhD in computer science while studying in John’s lab. Then there’s the other one. Dave Schrupp (–1) sings baritone, is a retired political science professor, and balances out the group. In short, we are almost all really “mathy,” so we looked for a name that reflected our mathy, geeky personalities that also had something that could relate meaningfully to singing in four-part harmony. Thus, the Quaternions!